2017 has been a year of surprises in terms of growth and positive sentiments. The global economy saw an accelerating upward graph for the most part of the world. Stock market boom, positive trade and reduced tax rate in the US has been the highlight of the year. The Brexit, North Korea nuclear tension and Bitcoin bubble has been keeping the world at its toes throughout 2017. The world economy is growing better than the projected rate by the IMF. World output has grown by 3.6% compared to the projection at 3.4%. There has been an upswing in growth in economic growth in Europe, China, Japan, and the United States, as well as emerging Asia. 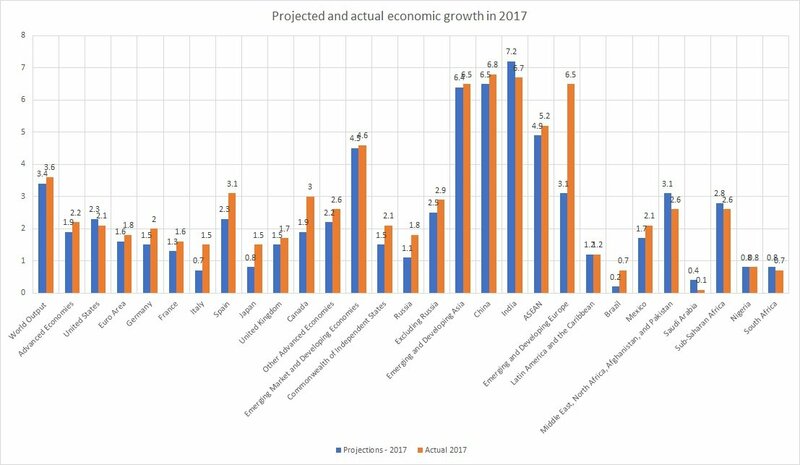 The current growth is also a positive perspective in terms of its broad-based nature and growth in economies which has been declining or is stagnant during the last few years. Big companies like Facebook, Amazon.com and Apple were the major contributors to scaling GDP and generated a revenue of 11.542 billion, 2,582 million, and 229.2 billion dollars, respectively. Apple is leading in the race to become one trillion-dollar company, bigger than the GDP of many world countries. Even with the rising protectionism sentiments in Europe and America, global trade has shown an upsurge in 2017. The Baltic Dry Index (which is compiled by the London-based Baltic Exchange and covers prices for transported cargo such as coal, grain and iron ore) has risen to its highest level in four years, indicating a recovery in global trade. Some major trading ports of the world in 2017 were Singapore (handled volume of 30.92 TEU), Hong Kong (20.07 TEU) and Los Angeles (8.16 TEU). Advanced economies like the US have reported falling rates of unemployment in 2017. Big giants like Walmart stands with the employment rate of 2.3 million. For United States Department of Defense, the stats revolve around 2.87 million employees and for People’s Liberation Army (China), it is 2.35 million. There has also been a wage growth, predominantly in the advanced economies. However, labor markets (gap between the supply of labour and the number of companies inclined to employ) are reporting a slack on account of high unemployment rates and big levels of part-time unemployment. The productivity growth too appeared weak in the last year. Oil and gas prices are another factors which is closely watched by economists since they play an important role in economic performance. The average prices of the oil have seen a rise from both 2015 and 2106 and reached the price of $51.64 per barrel. The biggest oil companies in the world for the year 2017 were Saudi Aramco (generated a revenue of $510 billion), Sinopec ($267,518), China National Petroleum Corporation ($262,573) and PetroChina (2.282 trillion CNY). Global stock markets have ended 2017 on a record high. There has been more than $9 trillion gain (MSCI index of bourses in 47 countries up by 22% and almost $9tn (£6.6tn) according to Reuters) over the year due to optimistic growth environment across the globe. The cut in US tax rates by Trump Administration and Brexit pave way for positive sentiments in the World Markets.